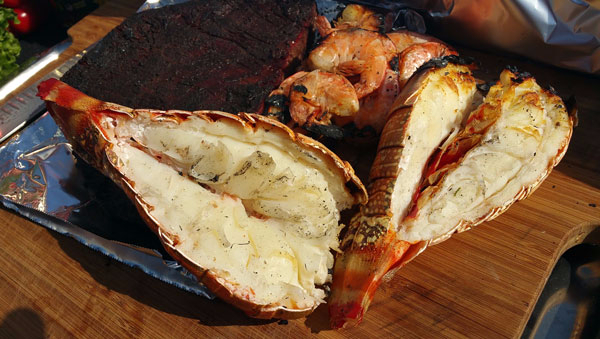 Here’s a recipe to try on your grill for the upcoming July 4th weekend. 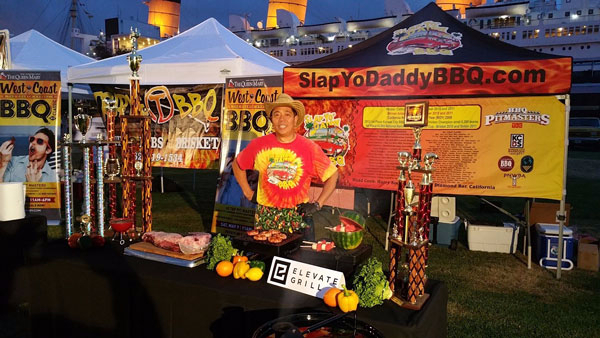 In my live BBQ segments with zany KTLA5 anchor Wendy Burch, I wanted to showcase caveman style cooking that viewers might find interesting to kick off the summer grilling season. 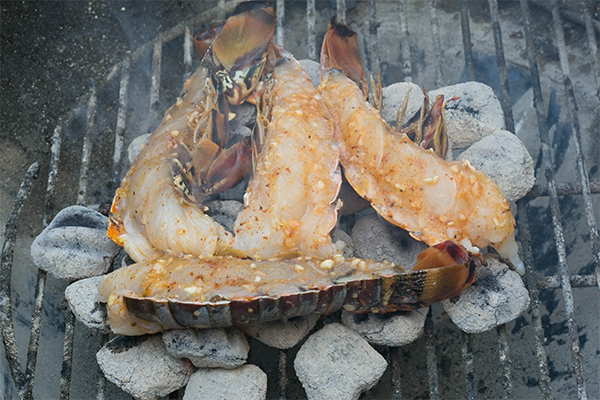 I’m not referring to Paleo-style diet that’s all the rage but rather cooking seafood caveman-style right on hot coals. 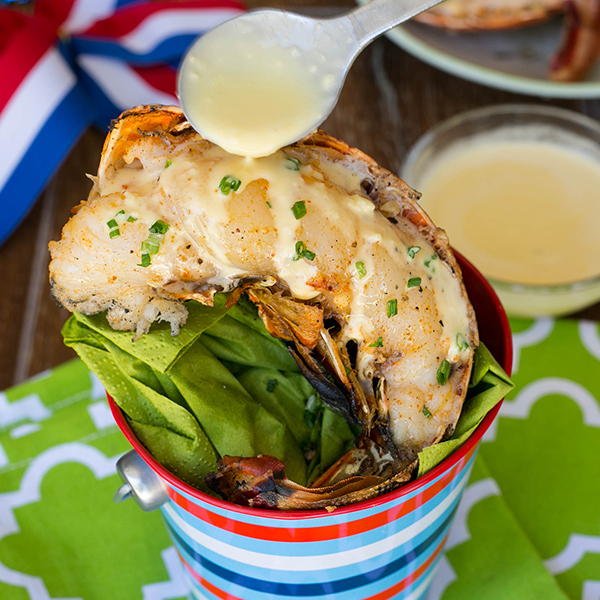 I prepared a grilled lobster that I was going to cook right on the hot coals on TV but in the chaos and compressed time frame of a live unscripted shoot, I didn’t get to demo the entire recipe. 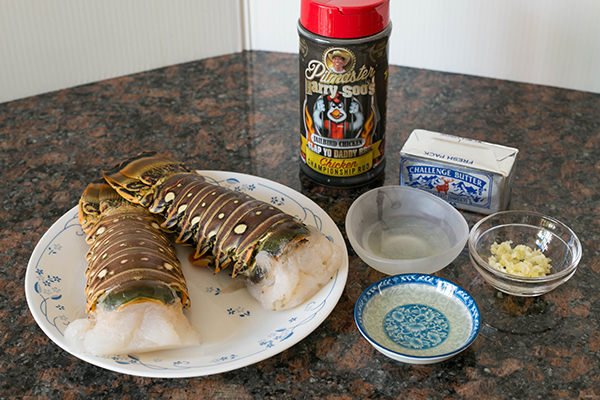 So here’s the recipe I planned for the shoot of lobster-in-the-shell cooked right on the coals with an egg sauce I concocted. I affectionately call my sauce Harry’s Foo Foo sauce as it’s my riff on the hoity toity French haute cuisine Béarnaise sauce. 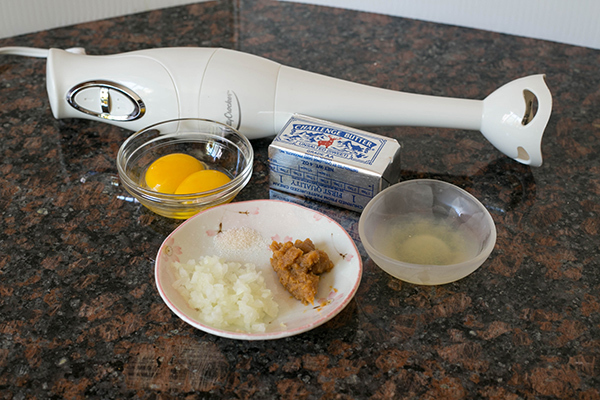 Mine is super-easy and made in 60 seconds using a propeller blender using boiling hot butter to cook the egg. Before the egg can scramble, it’s whipped into a foam by the boiling butter which creates a velvety smooth sauce that pairs perfectly with seafood. For a twist, I added some shallot and tarragon but you can have fun my versatile egg sauce recipe with optional extras such as Dijon mustard, white wine, white pepper, curry powder, saffron, and cayenne. Preheat your kettle grill with ½ chimney of hot coals. Don’t put the grate back on. Cut lobster in half with a heavy knife. Remove black intestinal tract or tomalley (green stuff) if present. Brush the shell with some oil to make it shiny and brush the exposed meat with a mixture of melted butter, SYD Chicken rub, and lemon juice, and if you want, some minced garlic. Use a piece of cardboard and use as a fan to blow away excess ash. 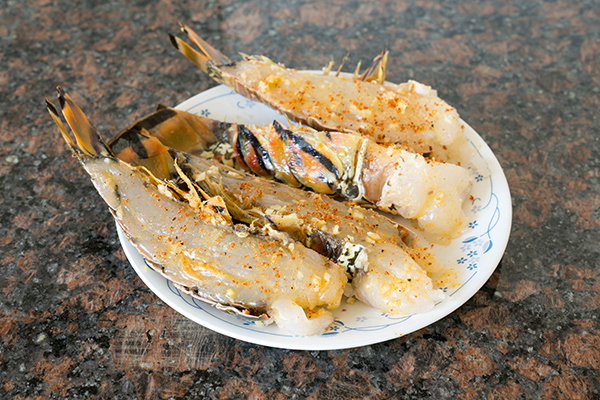 Use tongs and heat resistant gloves to lay the lobster shell side down and cook directly in the middle of the coals about 8-12 minutes. Baste it with more of the melted butter mixture as it cooks. When done the meat should be firm and opaque all the way through. Do not overcook the lobster else it’ll be tough. 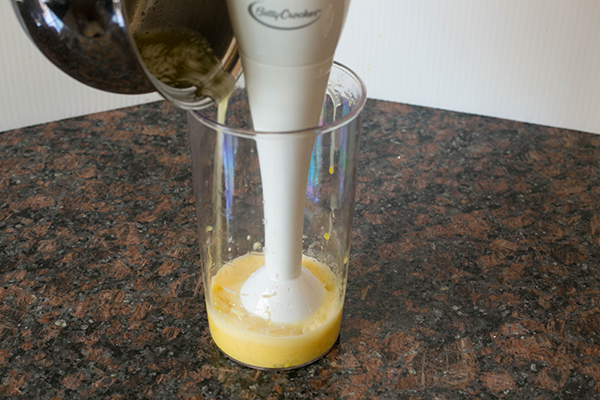 Use propeller blender to blend 2 egg yolks in a 1 cup Pyrex cup. 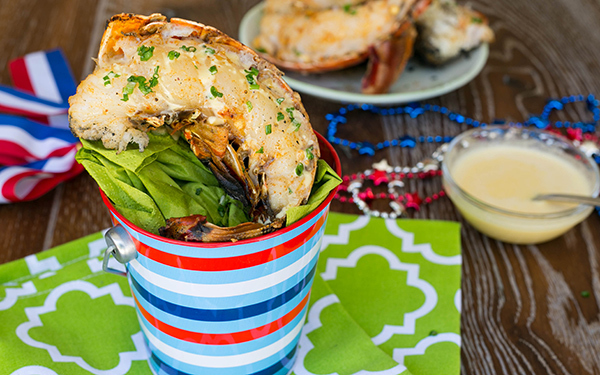 Serve the sauce immediately with the lobster hot off the grill. 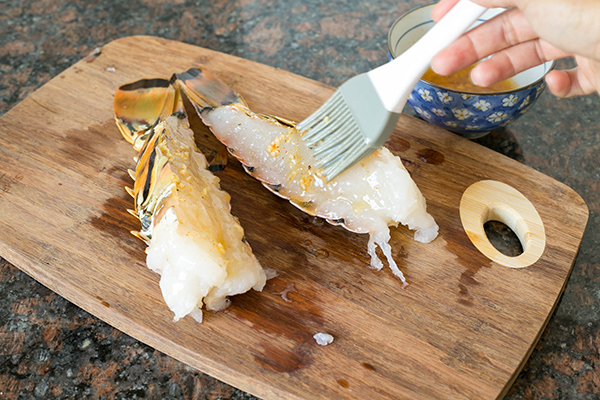 If you have ash on the lobster shell, brush it off with a dry towel.